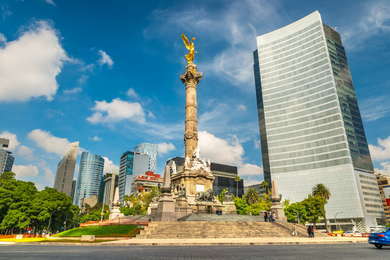 Formerly the Krystal Grand Reforma Uno, this 22-floor, 500-room smoked-glass behemoth is convenient to downtown, the Stock Exchange, Plaza de la República, and the Juárez and Zona Rosa neighborhoods. Guest rooms are large, with oversized TVs and comfortable sitting areas; the executive floor features butler service. There's also a full-service spa. The hotel frequently offers deeply discounted non-refundable rates on its website. Spacious rooms start at 344 sq. ft., with coffeemakers, work-friendly desks and 24-hour room service. White, simple, and sleek, with extra towels and powerful water pressure. A great meeting place, with a brass-domed lounge, snug little corners for tête-à-têtes, and a glossy, dove-gray marble floor. Located on the 9th floor, the indoor, skylit heated pool also features a cross-current for swimming in place. YOU SHOULD KNOW Children must be accompanied by adults. Spa offers extensive facial and body treatments, as well as a Turkish bath, sauna, and steam rooms,. there is also an and an attached beauty salon. The large and well-equipped fitness center is open 6am to 10pm weekdays, and 8am to 8pm on Saturdays and Sundays. El Caballito offers daily breakfast and lunch buffets. Sonora Grill specializes in grilled meat dishes from northern Mexico. Time Out bar is a basic sports bar, open until 1am. Located in the small colonia Tabacalera, it's a short walk to colonias Centro, Juárez, and Roma Norte. A branch of the popular El Cardenal (8-minute walk) is a must for breakfast. Gotan (4-minute walk) serves good Argentinian teaks and empanadas. El Bósforo (12-minute walk), a low-key but wildly popular mezcal bar. Café Habana (7-minute walk) is said to be where Che Guevara and Fidel Castro planned the Cuban Revolution; it serves beer and liquor in addition to coffee. A full-service, centrally located hotel at the edge of downtown, with a beautiful pool and frequent room bargains.